Goldman immigrated to the United States from her native Russia (where she had been a radical activist) in 1885 and became active in socialism, but increasingly gravitated toward anarchism. 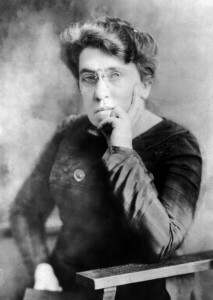 She was arrested and imprisoned on several occasions and in 1906 founded an anarchist periodical, Mother Earth, which she published until the U.S. government suppressed it in 1917. Jailed during World War I for her activities in opposition to the war, she was deported to the Soviet Union as a Communist in 1919. She was appalled by the effects of the Russian Revolutions, but continued to espouse anarchism. Her autobiography, Living My Life (1931), is a classic of political dissent.